Adlyn Carreras (left) plays Older Esperanza and Alejandra Tobar-Alatriz (right) plays Esperanza. Photo by Marc Norberg. 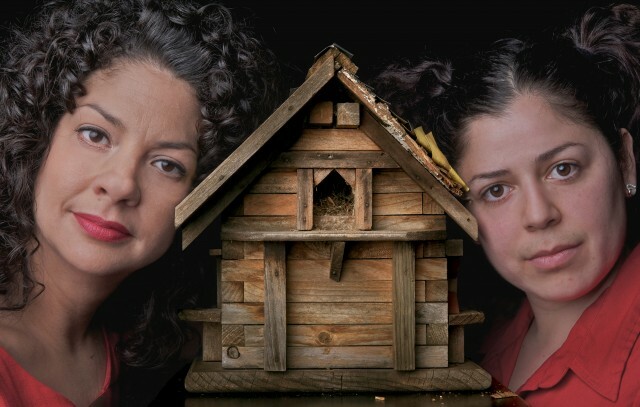 Teatro del Pueblo and Pangea World Theater are co-presenting an earnest view of childhood with actors playing multiple characters in Amy Ludwig’s stage adaptation of Sandra Cisneros’s book, The House on Mango Street. Alejandra C. Tobar-Alatriz and Adlyn Carreras play protagonist Esperanza as younger and older. The play’s episodic nature of growing up in a rough neighborhood lacks a strong overarching connecting thread to reel us in toward a climax, so as charming as some scenes are it plods along much of the time. Director Dipankar Mukherjee’s ensemble is committed to the play’s ideas around identity and youth, but at times the pace needs to quicken considerably. Sometimes it feels as if adult actors are forcing the child-like behavior of their characters. This is also exacerbated by there not being an intermission during the hour and a half plus duration of the show. Theater companies need to bear in mind issues of seniors, persons with disabilities, and others who need that break. An hour and a half plus is not reasonable. It has become standard for many groups ever since Joe Dowling’s two-hour Guthrie staging of Macbeth without intermission two years ago. It need to stop. And theater groups and their Boards of Directors that put forth socially conscious mission statements especially, need to seriously reflect on this. Southern Theater, 1420 Washington Av. S., Mpls.